The Miami Miracle was, like any even-half-decent football play, lovingly swiped. In this case, from one of the greatest college football games ever played: Boise State vs. Oklahoma in the 2007 Fiesta Bowl. The Dolphins’ last gasp was supposed to be the relatively simple hook and lateral that Boise State used to tie up that game at the end of regulation. (Remember?) Except, as Ryan Tannehill noted, those Broncos “ran it a little cleaner” than Miami did. Still worked, though. Boise State called their play “Circus,” and the beauty of Circus was that it allowed for even more laterals if the first one hadn’t paid off, putting other players in position to bail out the ballcarriers. They didn’t end up needing those backups, but they were in place. The Dolphins practice their version, called “Boise,” a few times a year. Just by chance, they practiced it on Friday. So everyone knew what they had to do. Tannehill found Kenny Stills, who found DeVante Parker, who found himself in trouble. But because the play so expertly prepared for that possibility, Parker found Kenyan Drake, who, some 52 yards and some wild seconds later, found the end zone. 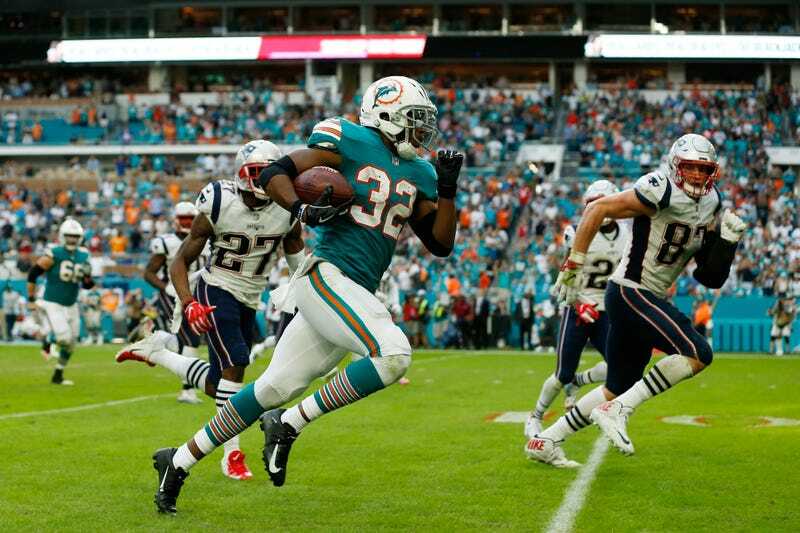 The Dolphins had beaten the Patriots 34-33. It was the first time in the 52-year history of the Dolphins that they scored the winning touchdown with no time left on the clock. At 69 yards, it was the NFL’s longest play from scrimmage to win a game with no time left since at least the 1970 merger. Take it all in, as many times as you need to. Or simply want to. There were unsung heroes here, none bigger than left guard Ted Larsen, who rumbled 40 yards downfield to lay a block on safety Patrick Chung to spring Drake for the final sprint. Chung had a marker on Drake, and the positioning, and probably would have taken him down if not for Larsen. They didn’t, and it came down to Drake vs. Rob Gronkowski, a matchup that heavily favored the fast little guy. “Drake runs a 4.3 (40-yard dash), and Gronk probably runs a 4.6 or 4.7, so you feel good about that matchup,” Tannehill said. Gronkowski was on the field because the Patriots were expecting a Hail Mary pass. He is 6-foot-6, so his job was to jump up there and knock the ball down. He’s a regular member of New England’s hands team. Not their feet team. 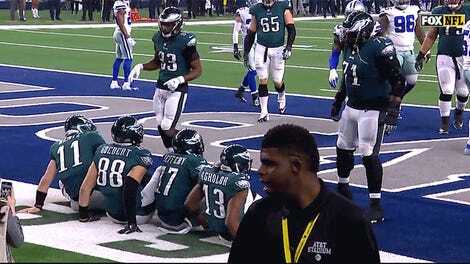 Gronkowski stumbled, and Drake took it home, and fired the football as far as he could into the stands. The whole thing was not, aesthetically, a thing of beauty, at least not like Boise State’s version. But the result, the only thing that matters, was the same. It’s always a good idea to make sure the miracle you’re asking for has a backup plan built in.